The Post has published several photos of suspects believed to be involved in Monday’s violence, in which a Cabot Circus jeweller was ransacked. At the front of the four-storey block, windows were smashed and paint was thrown by vandals. Staff at the newspaper are at work as normal, but a sign at the front of the building asks them to avoid using that entrance. Paul Breeden, chair of Bristol NUJ, said: “The NUJ condemns any attack on journalists or the premises where they work. There is no justification for violence. 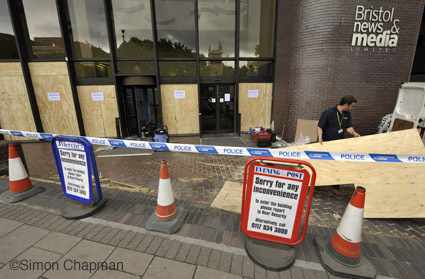 “If it emerges that the damage to the Post and Press building was connected to coverage of the riots, I hope that the law will take into account the importance of having a free press that is able to report on its community without persecution. “Journalists from the Evening Post, from the BBC, from the website Bristol 247 and elsewhere have been reporting on the recent disturbances sometimes in very difficult circumstances. What jaw- dropping hypocrisy of this NUJ journalist from the Evening Post to suggest that this biased, narrow – minded newspaper is in any way representative of the broad spectrum of political and social opininion with in Bristol or the UK. We all know and expect the reporting and analysis of events in the Evening Post is at the right wing reactionary level of the Daily Mail, of which it is a part. The Evening Post is not part of a “free press”. It is funded and controlled by interests that would never allow a broader and more truthful analysis of events, such as the recent riots, to be published. A real journalist investigates the truth and sees all sides of the argument. The real story can be found at http://bristol.indymedia.org/article/705459 . If you want to be a real journalist, leave the Evening Post and start writing the truth. It won’t make you rich, but at least you’ll have your integrity in tact. I don’t work for the Evening Post, but I think its journalists give a far more balanced view of events than the hate-filled article on Bristol Indymedia to which you refer. What you call “the real story” on Indymedia is a one-sided rant that boasts about criminal damage. You can’t possibly claim that it explores “all sides of the argument”. It’s also anonymous, which means the authors can’t be challenged. It’s not the fault of the Post journalists that the paper is owned by the group which also owns the Daily Mail. The two papers are quite different, as any open-minded reader can see. Local journalists aren’t highly paid; like everyone else, they can’t choose their bosses. And they work hard to report a balanced view of their communities. If it wasn’t for journalists, how would most people know about the recent disturbances, or the real grievances that some communities have?